Mars Variety Mix Funsize Sharepack is a good option for us as a family of 5 as we all like different kinds of chocolate bars. They are also a good size for the kids and doesn’t ruin their dinner even if i give it to them late in the day. I particularly like putting the mars bars in the freezer as it makes them go all chewy. How great is it to have the option of different flavours without having to buy multiple bags? Such a great way to enjoy some variety. Mars have some awesome sweet products and their share packs are always good for a crowd. A chocolate treat to suit every taste and some of my favourites too. Mars variety a fun size are perfect to share and a great selection to chose from.Wonderful for the luch box and they are all delicious! 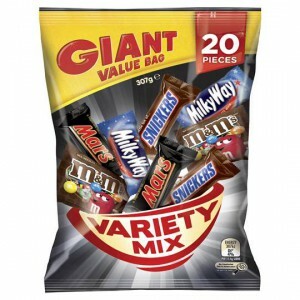 How would you rate Mars Variety Mix Funsize Sharepack?